Exploring the city of Kathmandu is an adventure, where one discovers pockets that offer quiet and solitude from the manic haste of the main thoroughfares. Venture outside of the Ring Road, the network that encircles the city limits, and your eyes will slowly see the concrete structures fading away into greenery and pastures that are soothing to the eyes. Kathmandu is also dotted with thousands of deities, some ensconced within grand structures, some in places less stately, but all bearing testimony to the spiritual bent of the Nepali heart. As a guest, to this city encircled by gently rising hills, one can find sanctuary in Nirvana Home, which is set within the peaceful environs of Salla Ghari, Maharajgunj, on the way to the famous Budanilkantha, where the deity of the reclining Vishnu is a majestic sight. 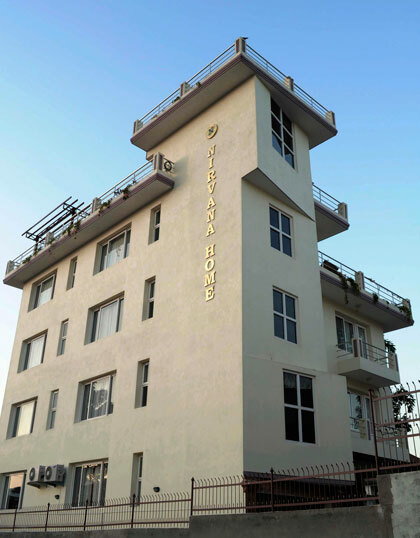 Only a 30-minute drive from Tribhuwan International Airport, Nirvana Home is a newly built property providing guests with a retreat that feels like the extension of one’s home. Peace and quiet are guaranteed in this residence-only area. The spacious lobby leads one to a flight of stairs that takes guests to the living quarters. 12 well-appointed rooms wait to be discovered, each very individual in character. Much thought has been put into the décor, which is apparent when you see the wallpapers matching the flooring, furnishing, and upholstery, reflecting a soothing play of colors. The spacious and luxurious rooms have all the essentials one would expect to find at a modern establishment, yet they manage to exude a sense of living in a home. The traditional warmth of Nepali hospitality mixed with a fine balance of Western-influenced unobtrusive service is apparent throughout. Each floor and each room are individual yet feel a part of a wholesome experience – that is quiet, tranquil, and relaxing to the senses. The balconies open onto a relaxing private space intensifying the homely feel. Guests can choose to walk up to the rooftop where one is treated to 360 degree views of the valley and with the weather favoring, spectacular sceneries of snow-capped mountain ranges to the north, west, and east. In the spring and summer this is a great space to relax with a drink in hand and watch the sunset. One can also make use of the sauna (dry) which is on the same floor. Just below the rooftop is a vast balcony which also houses a glass-enclosed Jacuzzi, offering an intimate atmosphere yet seemingly open to the elements. The spacious, tree-ensconced garden is a wonderful place to sit and relax, where one can choose to have breakfast or while away a lazy afternoon with a book in hand. The garden also has a clean 34’X20’ family-friendly swimming pool and guests can always opt for a dip. Embassies of several countries (Thailand, Australia, USA, Pakistan, Bangladesh) as well as specialty hospitals (Gangalal Heart Hospital, the Teaching Hospital, and the Neuro Hospital) are all within walking distance from the Home. Should you choose to venture into the city, guests have a choice of borrowing one of the city-bikes that are on standby, or opt for a pre-requested motorized drop off and pick up. Shop to your heart’s content in the amazingly colorful lanes of Thamel, where you can pick up local handicraft and knick-knacks. Thamel is also a gastronomer’s delight with the highest concentration of international-quality restaurants than anywhere in Kathmandu. Jostling with pocket-friendly eateries and bars, are places where local bands belt out cover versions of international hits, as well as local tunes. For a concentrated, all-under-one-roof shopping experience, one can visit the Bhatbhateni chain of super stores.